The annual meeting of the Friends of the Burlingame Community Library will be held Saturday, April 21, 2018, at the Schuyler Community Center, 218 W. Fremont, Burlingame, Kan. Everyone is invited to attend a presentation by local author Anna Hefley at 7 p.m., and make reservations for dinner to be served at 6 p.m.
“I Love You Bigger Than the World” is a poetic conversation written by Anna Hefley to honor her young son. Reservations can be made until April 13 for the dinner of pork chop, baked potato, green beans, slaw, dessert, dinner roll, coffee and tea, for $12 per plate. Make reservations at the library, 122 W. Santa Fe Ave., Burlingame, or by mailing name, phone number, and number of dinners to Friends of the Library, 133 W. Lincoln St., Burlingame, KS 66413. Checks should be made to Friends of the Library. Speaker for the evening will be Hefley, an Overbrook resident and author. She is a mother, full-time preschool para-educator, and part-time substitute teacher of grades pre-K through high school. She is a lifelong resident of Kansas, where she enjoys her home in the country and loves her supportive small-town community. She is working on her MA in English at Emporia State University and will graduate in May 2018. For 14 years, Hefley was blessed enough to be a stay-at-home mom, focusing all her care on raising her seven children. As the kids got older and more independent, she gained a larger family in the form of the dozens of preschoolers she is lucky enough to play with, teach, and love like her own every day at school. Hefley’s passion for literature and love for children culminated into the perfect opportunity to write children’s books. 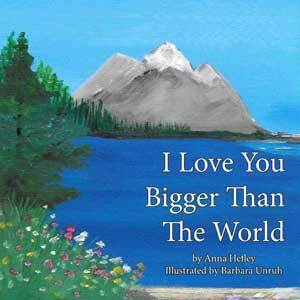 “I Love You Bigger Than the World” is a lyrical poem of a conversation between a caregiver and their child. The poem was written for Hefley’s son Jacob immediately after his passing at the age of two. It was stored away for eight years before being sent in for publication, when Hefley felt she was ready to honor her son in a public way. The book expresses the idea that no matter where a child ventures on their own, someone special will always love them. A love between a caregiver and a child is insurmountable by circumstances or distance – it is bigger than the world. Books will be available for purchase at the meeting. Hefley will speak at approximately 7 p.m. No reservations are needed to attend the presentation only; donations will be accepted to help with the costs of the evening. For more information, contact library director Brandi Shaffer at the library, 785-654-3400, or Friends treasurer Judy Schwanz, 785-654-2486, and leave a message.